Join the adventure as friends learn the basics of writing poetry and the use of rhyme, meter, alliteration, and other tools. 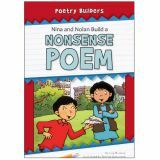 From limericks to acrostics, students can follow the story that shows the steps needed to create a new poem. Activities in the back of the book provide additional information and writing practice. Set of 8 books. Invite students on an inspiring tour of the colorful world of poetry! 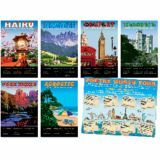 Styled after vintage travel posters, this bulletin board set acquaints students with traditional poetic devices and standard poetry forms, highlighting the imagery, language, structure, and mood of each. Includes six 11" x 17" posters and a 17" x 22" theme poster. Includes a two-page teacher guide. 7 pieces.